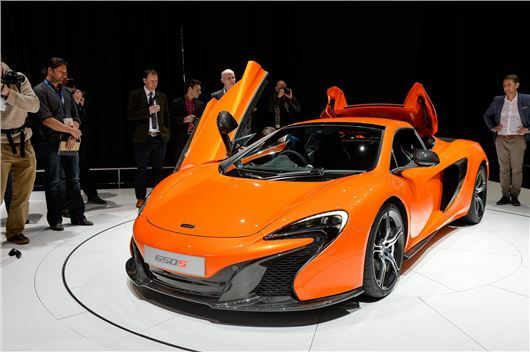 The McLaren 650S has made its world debut at the Geneva Motor Show. The car, which is based on the existing 12C supercar, takes its new front-end styling from the P1 and is claimed to be quicker accelerating than the McLaren F1. The new car slots in the McLaren range between the 12C and the P1 and uses the base car's platform and drivetrain. Power from the 3.8-litre twin-turbo V8 engine has increased to 650PS and torque has gone up from 600Nm to 678Nm. Claimed performance figures are eye-opening - 0-62mph in 3.0 seconds and 0-125mph in just 8.4 seconds. CO2 emissions have actually been cut by 4g/km to 275g/km. Other styling changes include a new front splitter, new door blades to improve airflow behind the front wheels and larger side intakes to cool the engine. Four new colours are available, along with higher levels of standard equipment – this includes carbon-ceramic brakes, sat nav, DAB, forged alloys and full Alcantara trim as standard with a rear parking camera and carbon-fibre racing seats offered as an option. The new 650S will be priced at £195,000 for the Coupe, and £215,000 for the Spider - it's already available to order, with first deliveries commencing at the end of March.